What is a pressure sensitive label? Are they stickers, product identifiers, decals or a component of decorative packaging? Yes! Pressure-sensitive labels are used everywhere from toys, food bottles, medical devices, and corrugated boxes, to plastic pouches and so much more. A pressure-sensitive label, or self-adhesive label, is made up of three layers: a face stock, an adhesive and a release liner. We refer to this as the "label sandwich." When a label is manufactured, these three components are sandwiched together to create a label material that can be printed on, laminated, die-cut, and finally peeled off and applied to your product. The facestock is the main part of the label. The material could be paper, film, or metallic foil. This is the layer where the ink is applied on press. For specific applications, a topcoat or laminate may be applied to protect the label artwork or enhance certain areas of the design. The adhesive is what makes the label stick to the surface of the product or packaging. For glue-applied (cut & stack) labels, this process happens as the label is being applied. 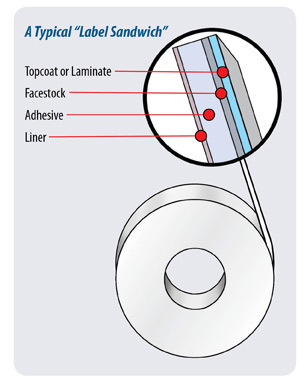 A pressure-sensitive label is manufactured to have the adhesive already applied to the face stock when you receive your roll or sheet of labels. The adhesive type will depend on your application and environment in which the label will be used. Many different types of adhesive are available including versions that stick under cold and wet conditions, some that release easily, some that stick permanently and others that are resealable. For example, a label that is applied to a durable good, like an air conditioner, will require an adhesive that sticks to metal in an outdoor environment and can last for years. If the label is only going to be used once, say for a shipping carton label, a strong adhesive isn't necessary. You might even select an adhesive that is re-positionable for a peel and redeem coupon. The liner is the paper or film that makes up the backing web material. There are options that range from semi-bleached paper or craft paper, to a stronger clear film liner. The liner is coated with a special material that makes it possible to remove the label no matter how strong the adhesive you select. And there you have it - our label sandwich explained! To learn more about labels, download the User's Guide to Labels.